or Download order form here. Please note that each labyrinth is made to order, individually sewn, drawn and painted, and takes 4-6 weeks in production until shipping. To see a canvas being painted, please click here. Flexible, durable and portable, many people have found the Veriditas portable canvas labyrinths to meet their needs. Made of high grade, heavy weight canvas, and proven to last, this labyrinth can be folded and put into a trunk of a medium size car, or if placed in two duffel bags, can be checked in as baggage and flown anywhere. Lauren's original canvas labyrinth has flown at least 200,000 miles and hundreds of thousands of people have walked the path. The standard size canvas labyrinth that Veriditas produces is 36 feet of canvas, with a 35 foot diameter labyrinth, drawn and painted with durable acrylic paint on the blank natural canvas. The labyrinth is usually painted a deep rich purple. It is made of three sections attached by Velcro, appearing seamless, and comes in a 45 gallon plastic tub on wheels for portability. Two people can have it set up for a walk within 15 minutes. The packing process takes about the same amount of time. Many groups have found this to be the perfect way to introduce the labyrinth into the community and bring the labyrinth to people to gain interest for a permanent labyrinth on their site. 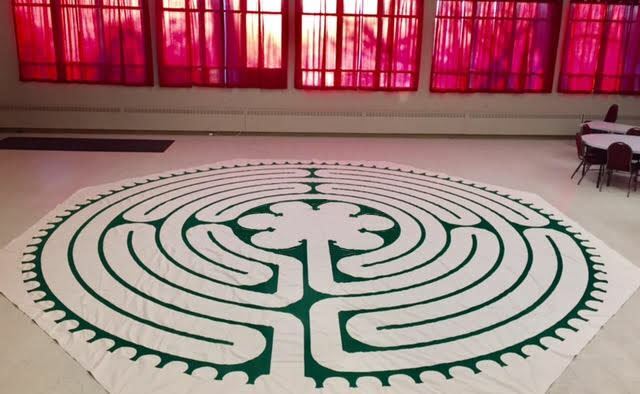 The canvas labyrinth, once set up, transforms a room into a sacred setting for those who have come for the walk. Yet the room can be returned to its original use within minutes of the conclusion of the walk. Please note that taxes (if applicable) and shipping will be calculated on check-out. For International Sales, Duty and Import fees are billed after receipt of the labyrinth. Candle wax on the labyrinth can badly stain the labyrinth, especially if it from colored candles, so protect your canvas from spills if you use them. When possible, ask people to remove their shoes and remember no food or drink on the labyrinth. You can keep a basket of socks for people to use to walk the labyrinth. When used outdoors, please use a tarp or floor covering under the canvas and never leave the canvas out overnight unprotected. To clean the labyrinth, sweep with a clean broom and fold to put back in its container for its next use. For a visual guide to folding the labyrinth, please click here. The Modified Medieval 7-Circuit Labyrinth Pattern is drawn and painted on a 24-foot octagonal one-piece canvas. It has all the elements of the 11-circuit Chartres canvas labyrinth and is formulated according to sacred geometry. 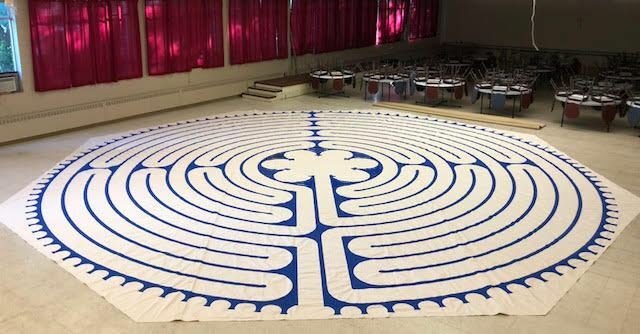 Removing four circuits allows for a walking path of the same approximate width as the 11-circuit 36-foot Chartres canvas labyrinth, but is contained on a 24-foot canvas, thus permitting its use within smaller spaces. This smaller pattern retains the full six-petal rosette center and entrance/exit similar to the 11-circuit pattern. It has six labryses that form the cross as do the ten labryses in the 11-circuit pattern. Contained within the modified 7-circuit pattern is the ancient spiral, which is also contained within the 11-circuit Chartres pattern. There are 84 lunations that surround the circumference of the modified 7-circuit Chartres-like labyrinth pattern. This modified pattern offers opportunity for the labyrinth to be brought into spaces that are not able to accommodate the 36-foot canvas labyrinth. The path is wide enough and the turns are as easy to walk as the larger labyrinth. The modified 7-circuit Chartres-like pattern would also be useful in working with children and the elderly because the walk is shorter, yet provides the full benefit of the longer walk. The canvas is shipped in a wheeled duffel bag for easy portability. For a visual guide to folding the 24-foot canvas, please click here. Other designs such as the Baltic Wheel and Classical labyrinth are available by special order. Please call the office for information about these.